Centerforce releases the 1,700 lb/ft-rated Diesel Twin clutch for 2005.5-2013 Cummins-equipped Rams. The Cummins ISB straight-6 diesel engines are legendary for their reliability, tuneability, and overall power potential. In recent years, this workhorse has been boosted from nearly 600 lb-ft of torque to over 850 lb-ft. Simple tunes can net increases of over 250 lb-ft of torque. 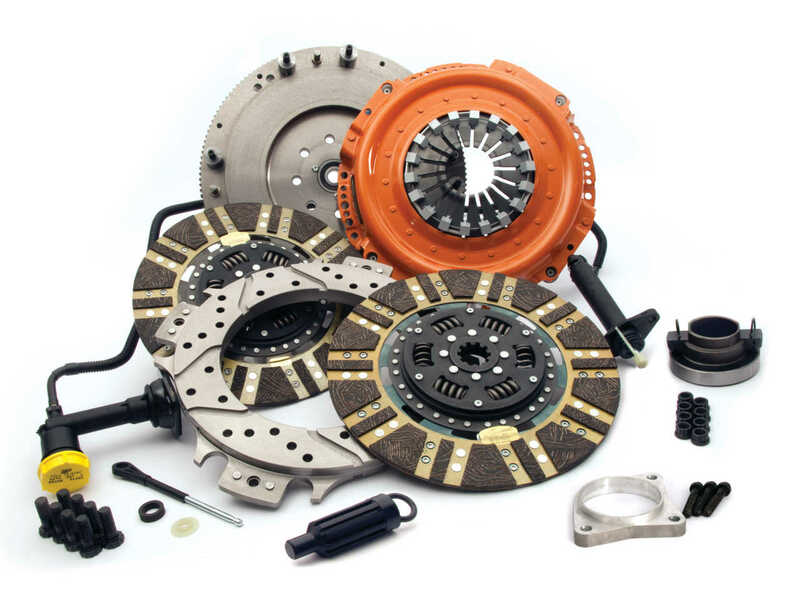 With increased power levels, the stock clutch quickly becomes inadequate for even basic driving, leading many enthusiasts to install an aftermarket clutch system — which historically results in drivability compromises. Centerforce developed the Diesel Twin clutch kit to eliminate common compromises such as stiff pedal feel, rough engagement and annoying noise. The Centerforce Diesel Twin uses two sprung hub discs with a patented floater design that uses spring-loaded bushings to absorb typical “floater rattle.” The floater is drilled and slotted like a brake rotor to dissipate heat. This configuration helps to retain stock-like drivability. Smooth engagement comes from the two-stage sprung hub friction discs, which were developed specifi-cally for the Cummins application. The primary springs help dampen engine vibration and transmission gear rattle, then the secondary springs absorb the shock and harmonics when the clutch is engaged. Centerforce’s patented ball-bearing pressure plate and centrifugal weights add the clamping force, giv-ing the Diesel Twin a rated 1,700 lb-ft holding capacity. Because diesels turn lower rpm than gas en-gines, Centerforce re-engineered the signature centrifugal weights to provide more force at the lower-rpm. Further, the pressure plate’s diaphragm fingers are adjusted properly at the factory — no need to align/adjust them with a prybar during installation. Attention to details includes: New single-mass flywheel with a larger-than-stock pilot bearing; a bal-anced pressure plate, floater and flywheel assembly (a paint mark indicates the proper balance align-ment); premium ARP fasteners/bolts; a new pre-bled hydraulic slave and master cylinder; a new throw-out bearing; a starter spacer and an alignment tool. Each assembly comes with a spec sheet with the test results specific to the clutch in the box. Centerforce’s new Diesel Twin kit (Part No. 04026651) is for 2005.5-2013 Cummins-powered Rams with the G56 6-speed manual transmission. For more information about the Centerforce Diesel Twin clutch system for the Cummins-equipped Ram truck, contact Centerforce, 928.771.8422, www.centerforce.com. A division of Midway Industries, Centerforce is an award-winning manufacturer of performance clutches and flywheels. The Centerforce brand has earned a well-deserved reputation for reliability, quality and durability where superior clutch performance and easy operation are mandatory. Continuous product development has earned Centerforce many U.S. and international patents. Based in Prescott, Arizona, Centerforce currently offers more than 1,600 non-asbestos clutch, pressure-plate and flywheel applications for performance cars, trucks, SUVs and Hot Rods.